This is like a "Commercial Break" for me. 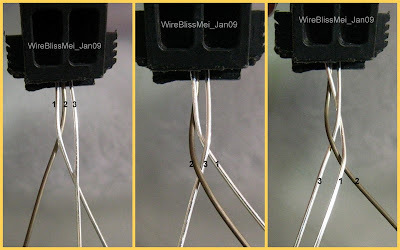 Do enjoy this Basic 3-wire Braiding Tutorial. It only takes about half an hour or less to finish a simple bracelet with this Basic 3-wire Braid Tutorial. Note: Read the pictures from left to right. Step 1| Cut 3 separate wires of about 9 inches each. Step 2| Grip all 3 wires with a quick grip (I used hubby's quick grip here :)). Step 3| Take wire 1 on the left over wire 2 in the center. Step 4| Take wire 3 on the right over wire 1 which is now in the center. Step 5| Continue by repeating Steps 3 and 4, keeping the wires as close as possible to each other. Step 6| Stop braiding when you almost reach the end. Leave about and inch to form spirals later. Step 7| Use something round (here I use Oil of Olay Suncreen Lotion bottle) to shape the bracelet. Step 8| Once done, use round nose and flat nose pliers to make tiny spirals of the remaining wire ends. Well done! You made yourself a simple braided bracelet. Labels: Tutorials for Free Share it! Excellent beginner tutorial!! 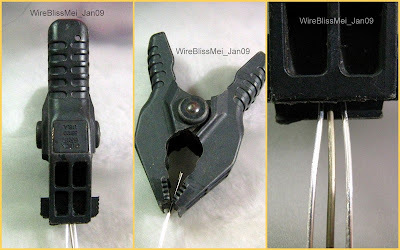 I too have "borrowed" my husband's vice which grips wire well. I found your tutorial through MyCraft. It looks great - looking forward to trying it! 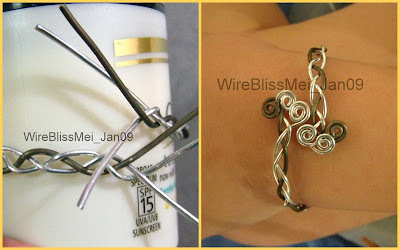 Thanks for posting this, It inspired me to give braiding a try, I have a bangle which I plan on posting this week. Thanks again for the inspiration. Thanks so much for the tips, Mei! I'll have to see if I can find a grip or vice to try one of these. whoa! I've got to get one of those! Thank you! wow..thanks Mei..will try that very soon. Saw your post about the wire gauge. Thanks so much! I am going to get some wire today and try it out. Thanks again!